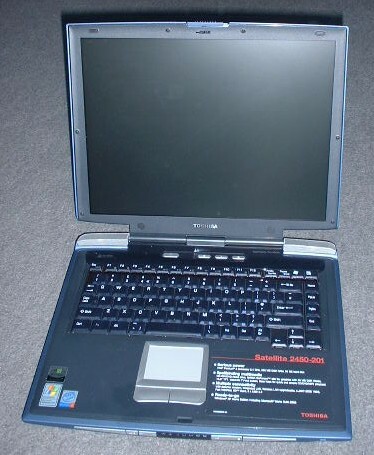 Here's my new toy.Toshiba Satellite 2450-201. Bought it on Friday (£1050). It came with XP Home pre-installed,but i uninstalled it and replaced it with XP Pro. I haven't had a chance to use it much yet,but the picture quality is impressive,especially DVD playback,and the sound quality from the SoundMax AC97 codec,coupled with the built in Harman/kardon speakers is excellent. Nice! You're still upgrading your Desktop PC? Yep,in a week or so. Very sweet little toy hehehe. I bought an Acer a few years back.It's a p3600 with an ATI 8mb mobile graphics and it came with windows 98se.I installed win2000 then win xp to see how it would run.After adding 128mb of pc100 for a total of 256mb xp ran quicker than 98 and 2000.I am amazed at the leaps and bounds that laptops have made since I bought mine.I paid about $1300 and could probably get a nice fast one that will play UT2003 or Max Payne.Good luck Rev,sounds like a winner.